One of my earliest blog posts upon arriving in Rome was about Michelangelo Merisi Carravagio. This one is about another Michelangelo, the less controversial, more universally acclaimed one. Or is this still true? That both were artistic geniuses is not in doubt. But many say Carravagio was or is now the more relevant artist, a hyper-realist whose art is more accessible, and whose life, triumphs and most especially failures, personifies the modern anti-hero. Believing this, buys into the hypothesis that the creative process of most artists goes hand in hand with chronic symptoms of agitation, of the manic type, and for some artists followed by symptoms akin to depression. While Michelangelo Buonarotti did exhibit certain aspects of the “artists' temperament”, he was not the tortured soul that Caravaggio was. He was and remains the product of the Renaissance, who labored to portray the sublime, the heroic, larger than life luminaries in accordance with classical tradition. And he lived to a ripe old age perfecting his vision and his art. 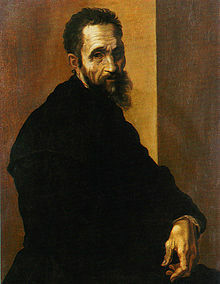 Michelangelo was born in Caprese, Italy, around 100 km east of Florence. (Notwithstanding its name, the delicious salad of buffalo tomatoes, mozzarella and basil, the Caprese salad, or salad in the style of Capri does not share Michelangelo’s roots.) His father Ludovico was a minor government official at the time of Michelangelo’s birth although he claimed being a descendant of the countess, Mathilde of Canossa. The family moved to Florence shortly after his birth where his mother died when he was only 6 years old. His father did not appreciate or encourage Michelangelo’s artistic interests and talent, considering the pursuit of art as not befitting one in his station in life. However, Michelangelo did not allow parental opposition to distract him from his chosen path and was soon apprenticed to the painter Domenico Ghirlandaio, and very soon afterwards found himself in the court of Lorenzo de Medici, which pretty much established the pattern of his life, working on commissions for persons of wealth and power, politicians, royalty and the clergy. I was able to see some of Michelangelo’s masterpieces in and around Rome as well as in Florence. I will cite them here not in the order I saw them but in the order they were created by Michelangelo. The first of these was the Pieta, completed by Michelangelo at the tender age of 21. This masterpiece is located in the first chapel on the right as one enters St. Peter's Basilica. When I first viewed the Pieta, many, many years ago, I saw it "in the flesh", so to speak. These days one views this through a thick pane of bullet proof glass. Returning to Florence after the execution of Savonarola, Michelangelo executed his statue of David, a personification of Florentine freedom, from a block of Carrarra marble. This statue stood in the Piazza della Signoria but is now in the Academia Gallery in Florence, with a replica gracing the Piazza. 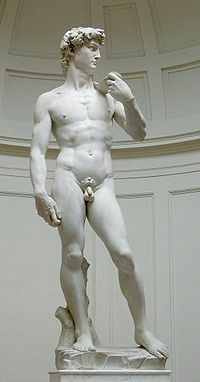 Seeing this majestic, massive statue of an unclothed perfect specimen of the male species made me understand why this was considered by many as Michelangelo's best work. The perfect, the sublime in true classical fashion, must have been too much for one deranged man who reportedly attacked the statue with a hammer, managing to damage some of the toes before he was subdued. Michelangelo's long relationship with Pope Julius II (the subject of the movie, The Agony and the Ecstasy), was to result in the statue of Moses found today in the church of San Pietro in Vincoli. This for me was the most "human" of all the sculptures of Michelangelo that I saw. (I really liked it). Moses was depicted after descending from the mountains with the ten commandments. Michelangelo captured the expression on Moses' face, as he discovered what his people had been up to, as he communed with God on the mountain top. Confusion, mingled with anger and frustration intensified by the rendition of the light around him, in the form of two horns. A story goes, as told to me by my Jesuit uncle, that after Michelangelo completed the statue, he took his hammer and hit Moses knees and said "now speak!" At around the same time, Michelangelo began working on the painting of the Sistine Chapel. Michelangelo was not really a painter and displaying a tinge of paranoia, he implied that Raphael had had a hand in his getting the commission to show that he, Raphael was the better painter. Afterwards, in the gift shop, I happened to look at a book I eventually purchased, containing the paintings in close up and vivid color. I noticed for the first time the contrast between the way Eve was painted at her creation and after the Fall. Pope Julius II was succeeded by Leo X of the Medici family, who brought Michelangelo back to Florence to work on several commissions for them. Disillusioned with the Medicis, he returned to Rome. At around that time he completed Cristo della Minerva, (Christ the Redeemer) which now stands in the church of Santa Maria Sopra Minerva. This work by Michelangelo was one of many that were "covered up", victim of the "fig leaf campaign" to cover up exposed genitalia in art during the Counter-Reformation. Apparently censorship stalked even the great Michelangelo. However, the censors were kinder to Michelangelo than others, whose statues were simply castrated. In 1534, Michelangelo was commissioned to work on the Last Judgement which is behind the altar in the Sistine chapel. Here too, Jesus and Mary were "clothed" after Michelangelo's death. Michelangelo was not only a sculptor and a painter but also an architect. He worked on or completed several architectural projects which I had the priviledge of seeing. 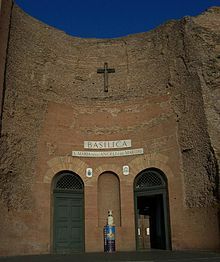 The first of these was the transformation of the frigidarium or the cold water baths of the Diocletian Thermae (or baths) into the Church of Santa Maria degli Angeli y dei Martiri. Michelangelo was also responsible for the Piazza della Campidoglio as it stands today. Thank you for providing this great post. This collection looks great and it makes any interior look fancy and modern.